An unusual position for a tourbillon flanked by retrograde hours and minutes. This is the Klepcys Vertical Skeleton Tourbillon from independent Swiss Manufacture Cyrus Watches (an evolution of last year’s model with a closed dial). 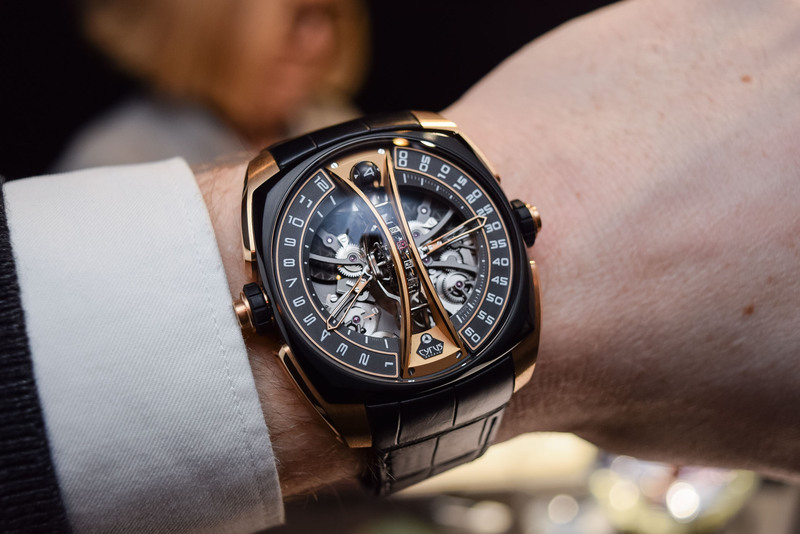 It was unveiled at Baselworld last year and was without a doubt one of the more unusual watches I got hands-on with this year. It also offered my first glimpse into a brand that I must admit I knew little about before. 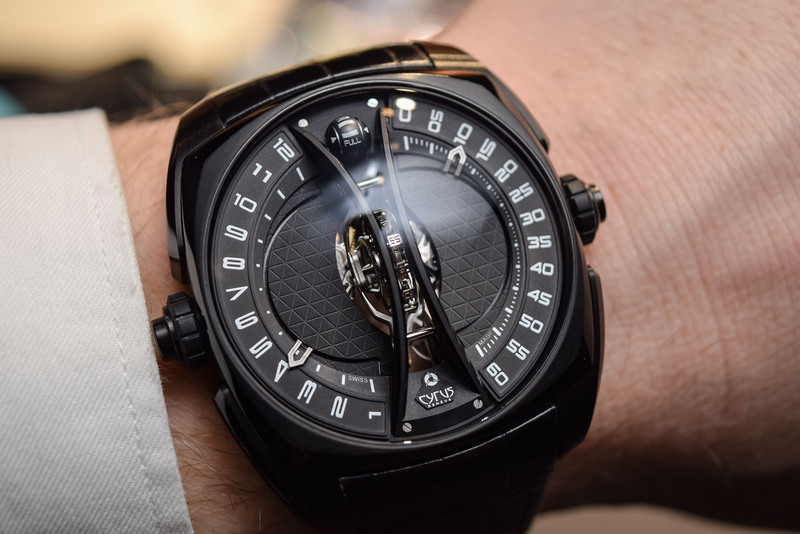 Polarising in design, I found this to be a surprisingly fascinating watch, not least because of its unusual and highly technical construction. Not that I would expect any less from legendary watchmaker Jean-François Mojon who is responsible for the manufacturing side of things. Take a closer look and let me know your thoughts in the comments. 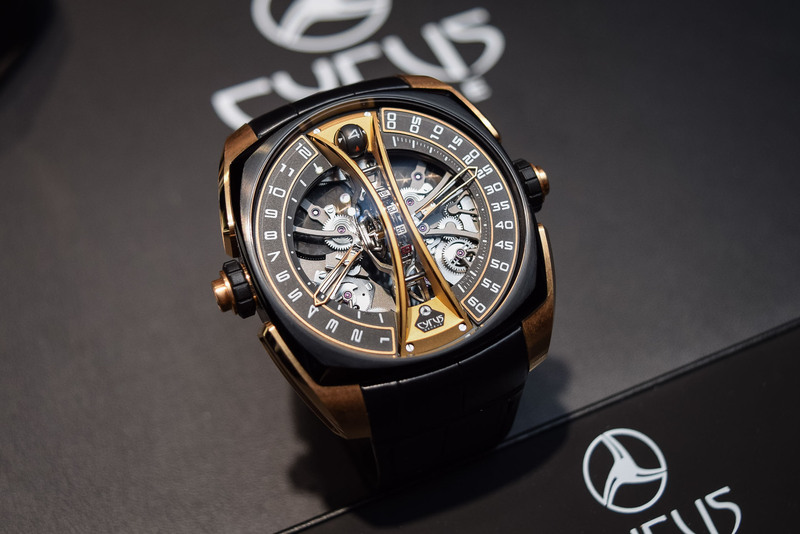 There’s not too much information available online about the origins of Cyrus Watches. From what I can piece together, the brand is owned by a very wealthy private Swiss family with a keen passion for watchmaking. Founded in 2010, its assembly workshop is located in Le Locle and overseen by Mojon. The brand states that the production of its watches is carried out entirely in-house. I have no way to independently verify this, so there may be some liberal use of marketing hyperbole going on, but I haven’t seen anything to suggest that this is not the case. In total, the brand offers seven different collections, some of which have limited production. 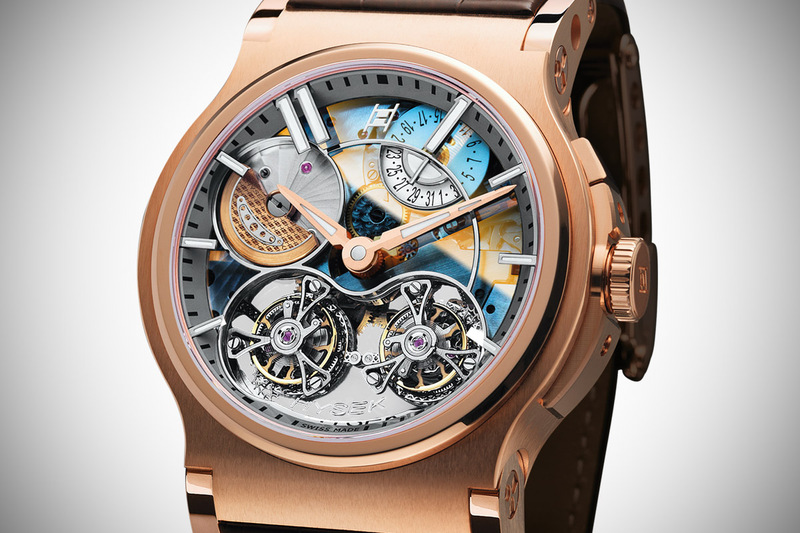 The Klepcys Vertical Skeleton Tourbillon falls into this category. 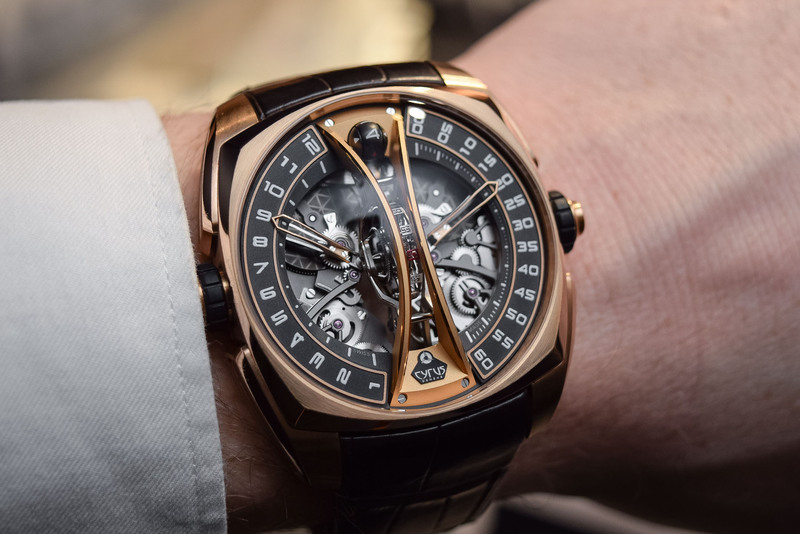 After the inaugural model presented at Baselworld 2018, there’s now a new model with an open dial, revealing most of the parts of the retrograde indications. We talk about highly limited watches here, with 5 pieces available in Gold & Titanium DLC, 5 pieces available in Gold and 5 pieces available in Titanium DLC. As you can see from the photos, I spent most of my time getting hands-on with the black-and-gold variation. 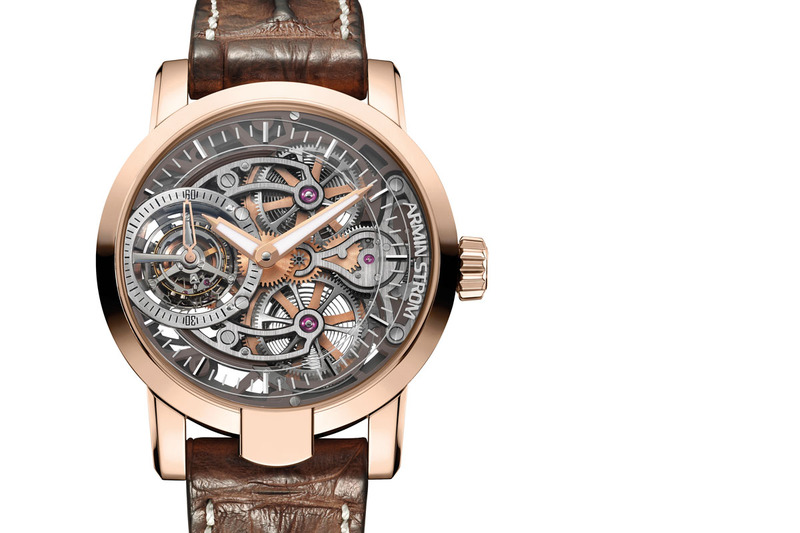 The key talking point of the Klepcys Vertical Skeleton Tourbillon is, of course, the vertical tourbillon. I don’t think I’ve ever seen anything quite like it (except recently with FP Journe) and I have to admit it is rather visually impressive – if a little over-the-top for my tastes. As you can see, it is set in the middle of the dial on a vertical axis and supported by an arched vertical bridge. If you look closely you can see that the seconds are displayed in five-second increments on the outer periphery. It almost calls to mind a tiny Ferris wheel. 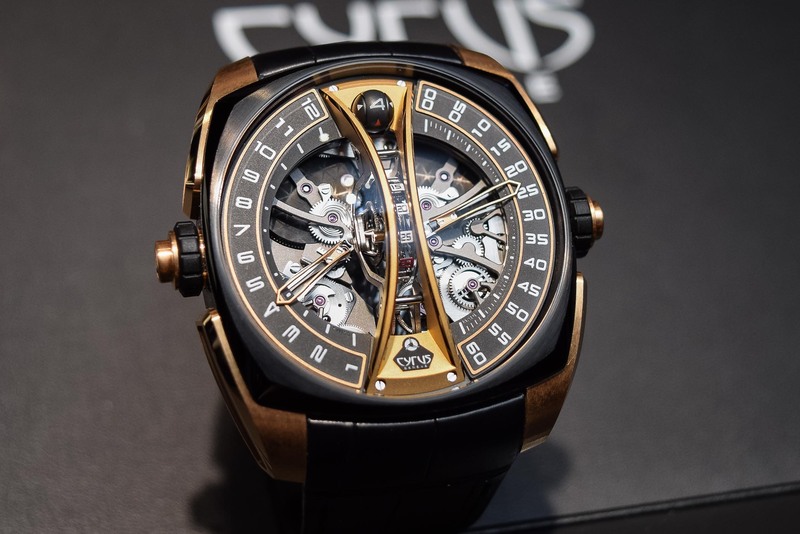 According to CYRUS, the decision to set the tourbillon cage at a 90° angle was taken following research by the brand’s in-house technical team on the positions of the watch over the course of 24 hours. 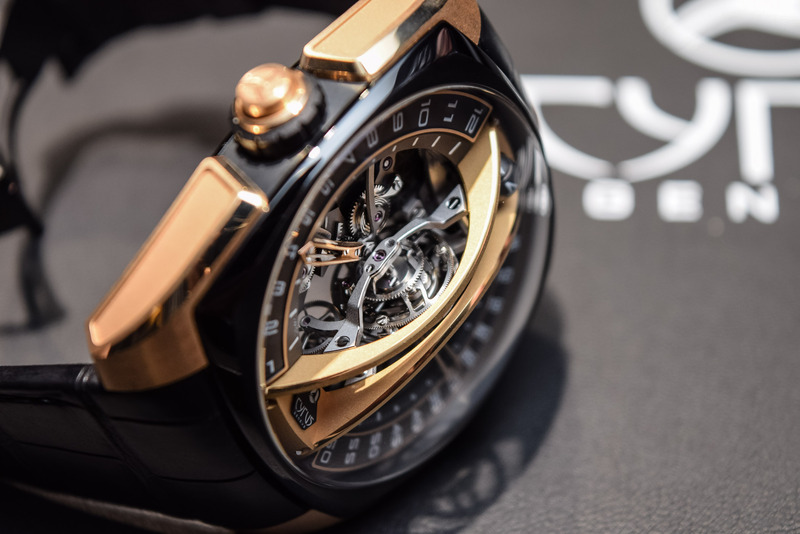 They believe that putting the tourbillon cage at this angle allows it to remain vertical in most cases. As a result, the cage containing the entire regulating mechanism (balance wheel, escapement and pallet fork) rotates more effectively, thus offsetting the negative effects gravity has on the balance and further improving precision. Whether that increase in precision is meaningful or not, I can’t say. 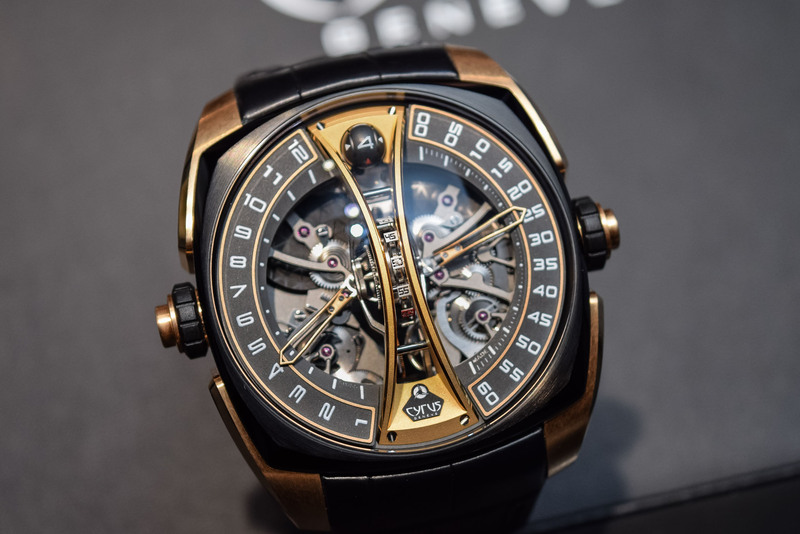 What I can say though is that the vertical layout allows you to appreciate the design and construction of the tourbillon in a way that is just not possible with a more standard horizontal placement. The bridge supporting it is quite impressive too. Made from gold or black DLC depending on the version, it is decorated using a “microbillage” (micro beading) technique, which gives it a glossy satin finish. It also boasts bevelled, polished edges. It has a very sculptured look to it that I found quite appealing. Again, way too over-the-top and large for my tastes but I can appreciate it for what it is. On either side of the vertical tourbillon, we find a double-retrograde time display. To the right, a gold or silver pointer (depending on the model) reads off the sweeping retrograde minutes, running from 0 to 60 at 5-minute intervals. On the left, there are retrograde jumping hours. Both feature Arabic numerals. As I mentioned earlier, seconds are displayed centrally on the tourbillon cage via small blocks engraved with Arabic numerals. Each block is engraved with Arabic numerals in white. The dial has been updated this year, with only the minutes and hours tracks left, all the rest being hollowed to reveal some gears and spring responsible for the motion of the retrograde indications. And even though this doesn’t help legibility or discretion, it makes sense in this high-end, complex context. Completing the indications is the power reserve shown on a small sphere (5mm in diameter) at 12 o’clock, nestled discreetly between the two arches of the tourbillon bridge. The power reserve is approximately 100 hours or around 4 days. All of this sits under a domed sapphire crystal custom-made for this model. Two-tone in 4N 18K rose gold and grade 5 titanium with black DLC finish. Twin crowns are apparently part of Cyrus’ design DNA and this model is no exception. The one on the right-hand side of the case at 3 o’clock has two positions: in position 1 it winds the movement and in position 2 it is used to adjust the time. The crown opposite at 9 o’clock is equipped with a pusher that enables the advancement of the hour indicator in one-hour increments. Useful you decide to wear this watch while travelling across time zones. Despite its impressive dimensions, I have to admit the Klepcys Vertical Skeleton Tourbillon was unexpectedly comfortable on the wrist. Admittedly not a watch I’d wear every day, but it certainly wasn’t as unwieldy as I was anticipating. On the reverse side, a sapphire caseback reveals an in-house manufactured hand-winding movement. 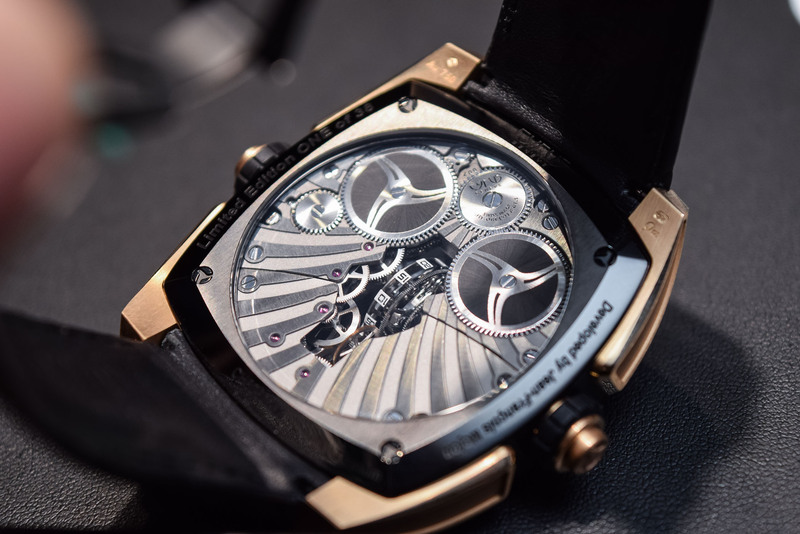 Beating at a frequency of 3Hz, the movement uses two parallel barrels with black lacquered ratchet wheels. 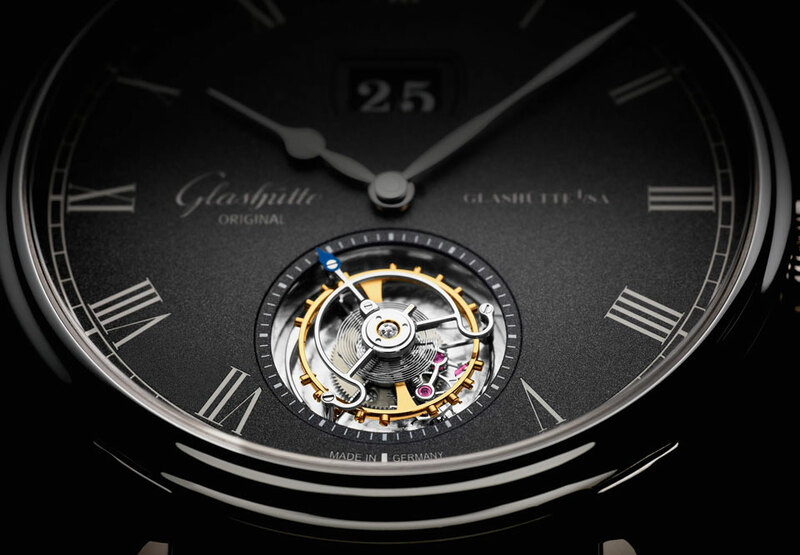 Just underneath, an opening in the centre reveals more of the vertical tourbillon as well as part of the gears. In total, the movement is comprised of 344 parts, including a Swiss pallet fork escapement and a variable-inertia balance wheel. The bridges are decorated with a slightly curved sunray pattern, with alternating polished and opaque finishes. The bridge screws have mirror-polished heads. Not the most elaborately decorated movement you will see but nicely finished nevertheless. A slightly less busy dial was offered on the black model introduced in 2018. Still the new version with opened dial makes a stronger impact. 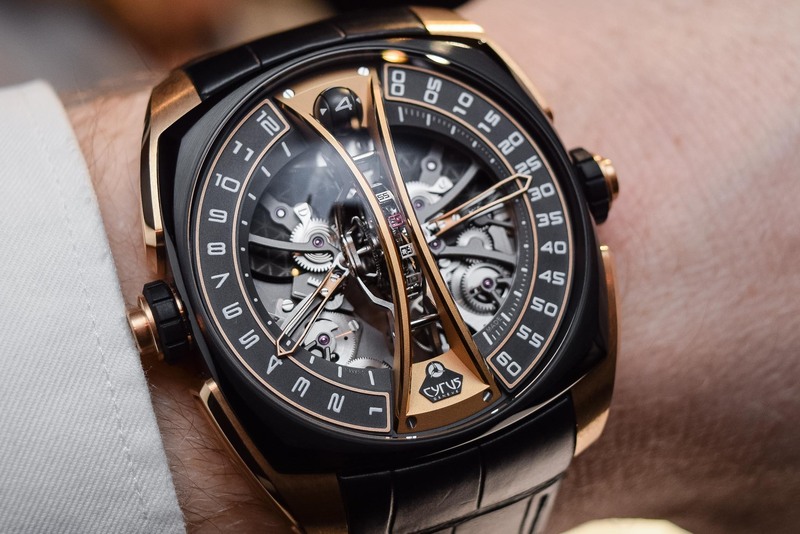 The Klepcys Vertical Skeleton Tourbillon is worn on either a black alligator leather strap with folding clasp in titanium black DLC or brown alligator with folding clasp in 4N 18k rose gold. Price for the Titanium version is EUR 130,000, while the Rose gold/black DLC version is EUR 144,000 and the full Rose gold version is EUR 164,000. 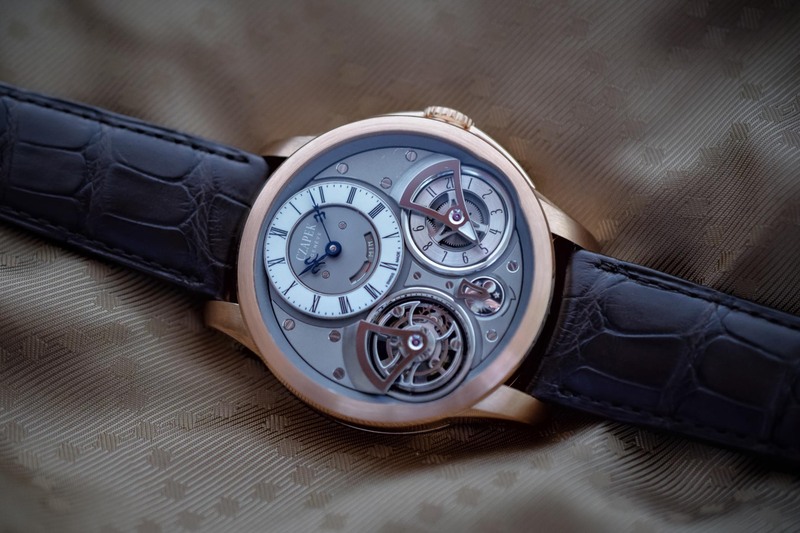 I agree technically it’s more interesting than most tourbillons, but aesthetically it’s a big mess for me. Another very clever watch, probably very satisfying to build but who would want to wear it let alone pay for it?